The Pros and Cons of Upper Cabinets and Open Shelving - Columbia Builders, Inc. Your kitchen design and aesthetic can be drastically different depending on whether you choose upper cabinets and open shelving. Integrating storage space into the kitchen design of your new home requires a great plan with the proper balance of function and aesthetics. And, we’re here to help you achieve the perfect combination of beauty and performance that you envision! From the pantry to drawers and cabinets to shelving, we understand that all of your important kitchen accessories will need a place of their own. Many homeowners find that upper cabinets provide the best storage capacity, but open shelving designs are quickly gaining popularity. Both options have advantages and disadvantages to consider. The pros of upper cabinetry are pretty clear – you get a lot of usable storage space for your plates, serving pieces and glassware, while at the same time giving your kitchen a clean, composed look. Cabinets can hide clutter and suit any design plan. Upper cabinets are easily customizable as well – from a painted or classic wood finish to knobs and handles. However, the sheer number and configuration of upper cabinets can also cause your kitchen to feel somewhat constrained. It is very difficult to create a true air of openness in a kitchen that features upper cabinets. If you’re aiming for a light and airy feel in your kitchen, you may need to look to other storage options. Open shelving instantly creates this open-air feeling. This method of storage is also a wonderful way to express your personality, allowing you to place anything you’d like on the shelves for display. From collectibles to glassware to pottery, shelving allows both creativity and an individualized design. The disadvantage is that the shelves must be kept clean and organized to create that decorative and eye-pleasing display. Also, it can be tempting to place unnecessary items with no obvious storage place on the open shelves – which leads to an unattractive and cluttered look. 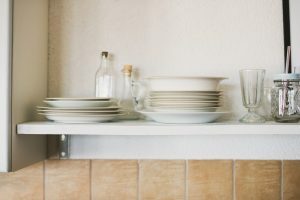 The shelves and their contents will be dust collectors, so items such as plates and glassware that are used (and cleaned) every day might be best suited for out-in-the-open storage. This entry was posted on Friday, July 20th, 2018 at 10:03 am. Both comments and pings are currently closed.